These SweetPea Ring Slings are designed for the water! Use your SweetPea Water Ring Sling in the shower, at the pool or on the beach. Very sand resistant! Wear the sling to the beach, in the ocean and home and straight into the shower with your baby! I ordered and personally tested many different types of water fabrics before deciding on these fabrics. I have eleven years experience in the babywearing business to choose the right fabrics and provide you with a supportive, quality product. SweetPea Ring Sling water slings are made from two mesh fabrics that are moisture wicking, breathable, quick to dry and mildew resistant. These two fabrics together are very light weight but also very supportive! 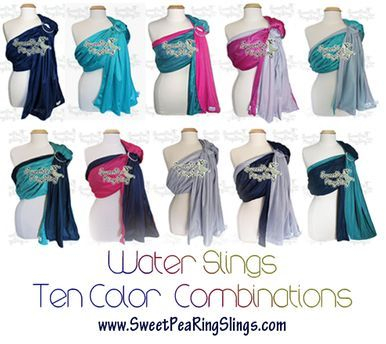 Like all SweetPea Ring Slings, these waters slings are double layered for support. As always, there is no top-stitching around where the baby sits, which can dig into their chunky legs! These slings are approximately 30 inches wide and 72" long (Like all SweetPea Ring Slings, you can get the sling longer or shorter for no additional charge). I am recommending these Mesh Water slings to be used for babies up to 35lbs. Babies and baby carriers can be slippery when wet; extra caution should be used while wearing a baby in a mesh water sling. If you need a sling for hot weather, a more supportive option for long term, every day use would be the linen slings. SweetPea Ring Sling Water Slings are Double Layered for Support! Turquoise, Navy, Bright Pink and Silver. sling in any of those colors. Each sling is 100% Visually Reversible. These slings are approximately 30 inches wide and 72" long If you need it longer or shorter, please indicate that when you checkout. All SweetPea Ring Slings are 100% Visually Reversible for two looks in one sling. Navy/Turquoise Water Sling at the Beach! The fabric for the slings are excellent sand repellents! If the tail is dry, you can use it to brush sand off of you and your baby. Light Weight, Breathable, Fast Drying Fabric.